Spenco diabetic socks at Corey’s Bootery are the perfect solution you need if you suffer from diabetes-related foot pain or numbness and want to walk around in something other than your diabetic shoes. All our socks are diabetic approved by doctors and contain a variety of features to help you walk in comfort. Each pair of Spenco socks is seamless at the toe, so you do not suffer from rubbing or irritation a seam may cause. They are also graduated at the top lines of the sock to make sure that you don’t get the ring around your calf caused by a swollen leg. 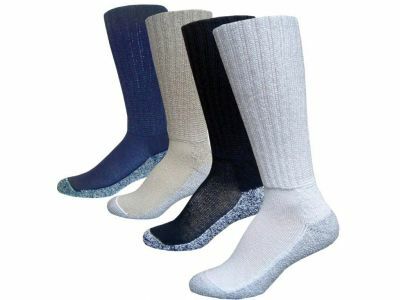 But, the elastic rib at the same top ensures that your socks stay up on your leg and don’t fall. We at Corey’s Bootery know how frustrating it can be to have your feet affected by diabetes, so we make sure the Spenco’s socks that we sell give you more than the basic comforts. With a moisture wicking material sewn into every diabetic sock, they help with moisture control as well as temperature control. Every time you purchase a Spenco diabetic sock from Corey’s Bootery, you know that you can live in comfort. With over 40 years of experience selling specialized footwear, Corey’s Bootery is the best shoe business in Kalamazoo for the treatment of foot pathologies. With custom orthotics, custom shoes, and a range of shoe modifications, Corey’s Bootery is ready to help you find the best personal footwear solutions.